A straw broom makes an excellent tool to whisk overspray off windows and drywall. Straw broom: A smaller straw broom (approximately 3 feet long) makes an excellent tool to whisk away overspray. The stick end can be ground down into a point like a pencil. This allows you to clear the small corners and angles. You should trim the broom back so that the bristles are stiffer. ALSO, a strand from the broom makes a perfect tool to clean out clogged spray tips. Canned Foam: Around doors, windows, sill plates and small gaps, canned foam is an inexpensive and excellent compliment to wall spray. Use low expansion foam designed for doors and windows. Protip: When using canned foam, don’t let the foam cure completely then trim. Let the foam cure for a bout 10 minutes, until it loses tackiness, then using a straight edged piece of lumber, press the foam in. Trimming mostly-cured foam usually results in tearing the foam, leaving an unsightly foam bead. There is no need to press the sill plate foam in. Small Putty Knife: Not everyone wants to deal with foam. 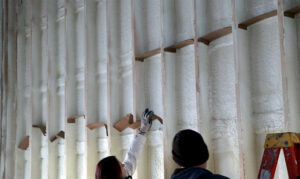 Fiberglass and rock wool make for great insulating materials. Use a putty knife to stuff the cracks (you don’t have to smash the material in, nor should you). Moisture Meter: You should know the percentage of moisture in your wall spray. Walls should not be covered until the moisture has reached 25% or lower. Advertising tip: Cool Machines spray equipment is designed to use up to 30% less water than other brands. We teach a low water usage spray technique which leaves the job with about 28% moisture content when installed. Magnetic brooms pickup the “invisible” items your broom may have missed. Small Broom, Push Broom: Since you will be recycling material back into your machine MAKE SURE you clean the perimeter of the house very well. You do not want to send a hurricane strap or nail into the recycling process. Magnetic Sweeper: The last thing you want recycled back into your machine are steel objects left behind by other trades. A magnetic sweeper is an excellent tool to insure that everything has been picked up. Trash Can: Used to discard junk during prep clean up. 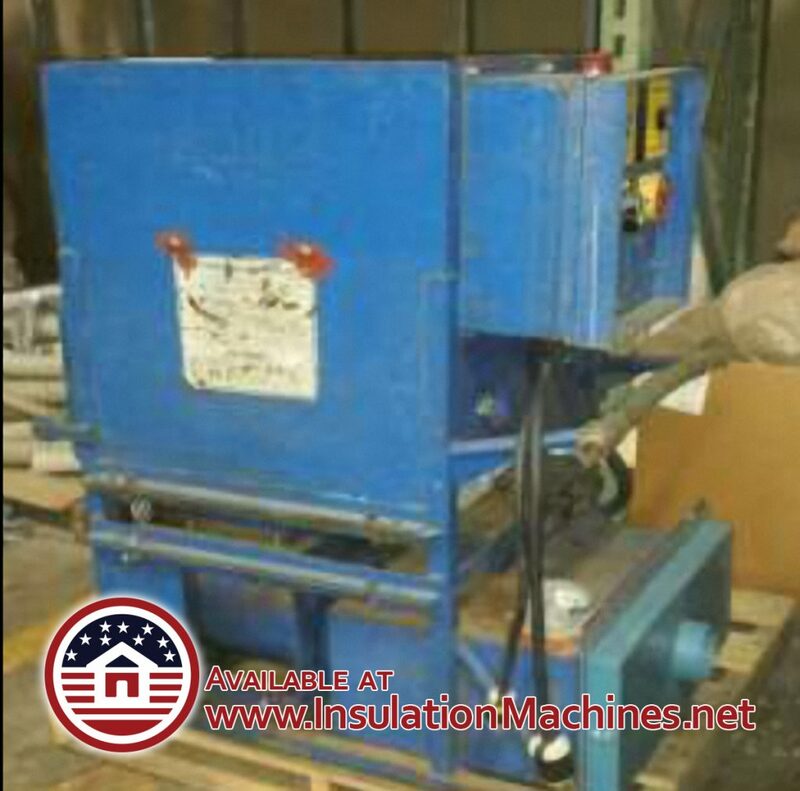 This is also used to manually recycle material back to a machine which does not have recycling equipment. Our CM700 Recycler uses a square shaped trash can. Make sure you get one with wheels to make your job easier! Flat Grain Shovel: Use this, rather than a dust pan, to clean up during prep-work. These broad shovels make manual recycling fast work. They are also great at dressing the tops of sprayed runs that are gapping at the top plate. Duct tape: Have plenty of low-tack duct tape to cover electric outlets. Cardboard makes for excellent support when you have wide or very tall cavities. Cardboard: Cardboard makes an excellent shield to prevent overspray on windows and doors. Also, you may find a very wide or tall cavity that causes your material to fall out. Use the cardboard to make blocking to divide troublesome cavities. Dense packing fabric. If you have to spray an open wall, then all you need to do is staple fabric to one side of the wall and then you are able to spray that wall. The following is a suggested list of tools and materials you will want to have on-site when you do attic fills and dense pack. Extending Ladder: The folding and extending aluminum ladders are great! They take up less room in your truck/trailer. The Little Giants, Werner and Gorilla are perfect. Make sure you can reach 12 feet. Sometimes those attic accesses are placed in higher ceilings. Moving Blankets: Carry a couple of moving blankets to protect the window jams if you are pulling hose into an upper level. 50 feet of Rope: Helps pull hose into upper stories. Some contractors will use their electric cords. That is unwise and can cause breakage/shorts in the cords. Head Lamp or Utility Light: Either lighting source is a preference. Some contractors like to illuminate the entire attic with a strong utility light. That requires another extension cord run and takes a couple more minutes for setup and tear down. I prefer the head lamp. They are inexpensive, LED lights and are very brilliant, allowing you to view a wide area where you are working. They don’t require any extra set-up time. N95 masks: There are dust and nuisance masks, then there are N95 masks. Dust and nuisance masks fail sooner during the job, especially in hot attics. N95 masks are rated to prevent fiberglass particles from entering your mouth and lungs. They are available with a breathing valve that allows your moisture-laden breath to flow out and not compromise your mask during your job. These masks are VERY important and should not be considered an option. I was not provided the proper masks and developed Minor COPD condition in my lungs. Attic Rulers: These are stapled into place on the rafters. Place the rulers so that the measurements can be seen from the attic access. Placing one in each corner of the attic and one close to the access hole. Hammer-style Stapler & Staples: These staple hammers work better than the squeeze staplers. You can carry them in your back pocket as you crawl through the attic system. Duct Tape: Many insulators do not use hose clamps on every connection joint of their hoses. They will use one initially at the machine because the pressure is too great to hold the hose to the machine output. However, use them to connect your hoses. Here are two reasons why duct tape is preferred. Firstly, duct tape will protect the baseboard trim, corners and window frames in the house as your hose is pulled through. Secondly if there was a plug it is a lot faster to meeting with him at the knife to cut productive moves are you separate the hose where the joint. Nut Driver: Hose clamps are tightened and loosened by a helix screw. That screw can be turned with either a screwdriver or nut driver. A hex nut driver is far easier to use as screw driver blades easily slip as the clamp is tightened or loosened. Electric Cables: Use good, 12-gauge electric cables. Do not use more than 100 feet long. Longer than 100 feet causes electrical friction which will degrade your electric blowers sooner. Basic socket wrench set: The Cool Machine brand of insulation machine can be torn down, fixed and rebuilt on site with a simple socket wrench set. Utility knife: Whatever knife you choose to use, make sure you secure it to your hopper so that it will not drop in. 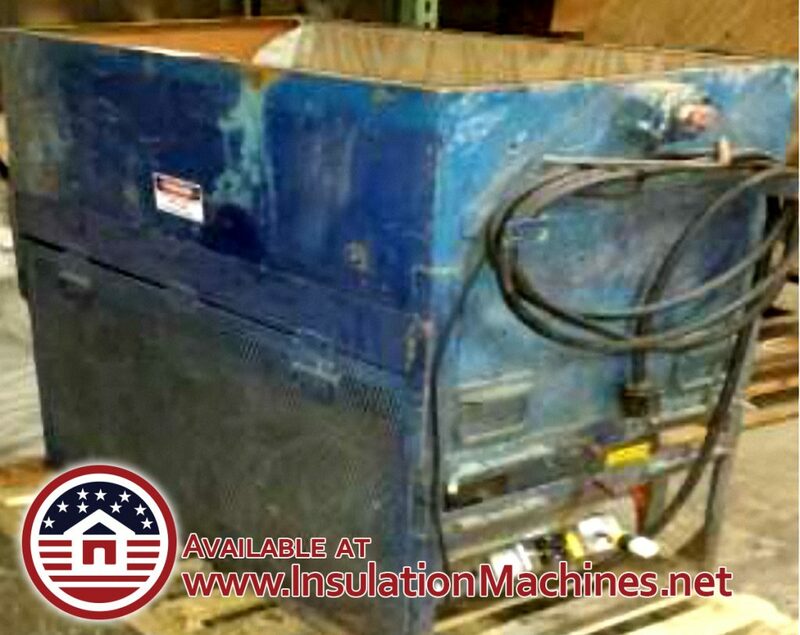 Voltage Meter: Cool Machines provides a voltage meter with each new machine purchase. This is helpful for troubleshooting electrical issues if they arise. Broom, Dustpan and Plastic Garbage Bags: Keep the floor of your truck and trailer clean. DO NOT sweep up the floor and dump the material into your machine. Too many foreign objects can end up on the floor. Wet/Dry Vacuum: This is a great tool to carry with you. 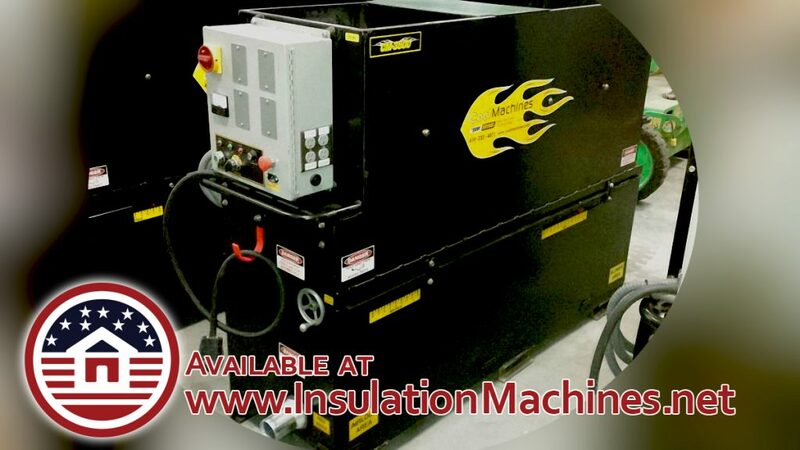 This will allow you to clean out your machine AND just in case you dumped a pile of insulation in a house, this will be great to have for those clean-ups. Sometimes there are things that arise that you did not anticipate for when you chose the materials for your job. Here are some items to always keep in your truck/trailer so that you can do a proper job. 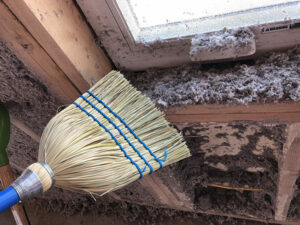 Insulation is rated as a top “dirty job.” Cellulose is one of the dirtiest materials to install. 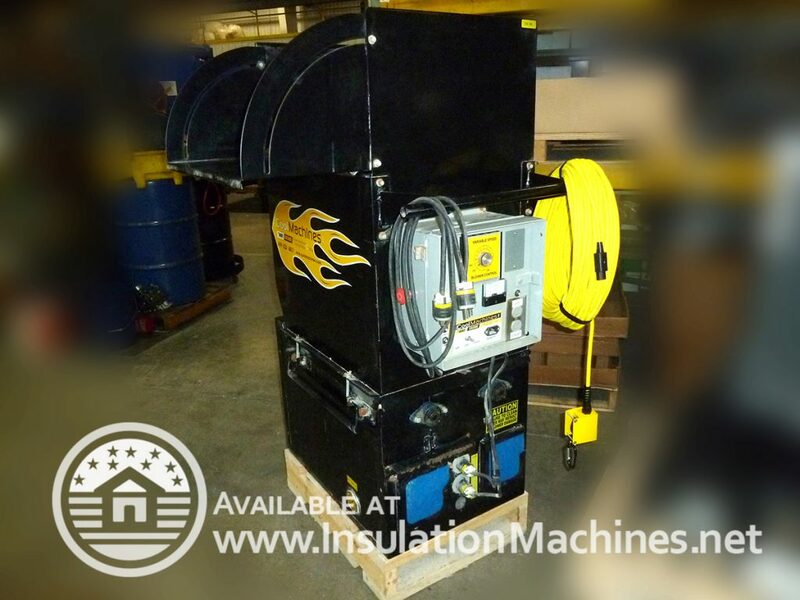 It creates a high volume of dust and needs to be controlled in the working environment. 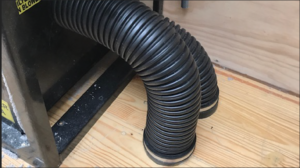 Solution 1: Steve Maki with Accurate Insulation Solutions in Ixonia, Wisconsin used solid corrugated pipe to connect the filter cover to a plate he created to finish the connections through the floor of his truck. He used a 4″ piece of exhaust pipe and welded it to a flange which he screwed into the floor of his truck. 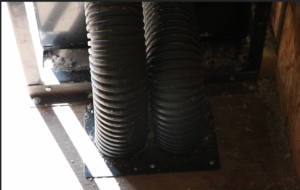 He then used hose clamps to hold the corrugated pipe in place. Duct Tape and Hose Clamps: Steve wrapped the 4″ outlet from the machine with two layers of duct tape to give better friction for the corrugated pipe. 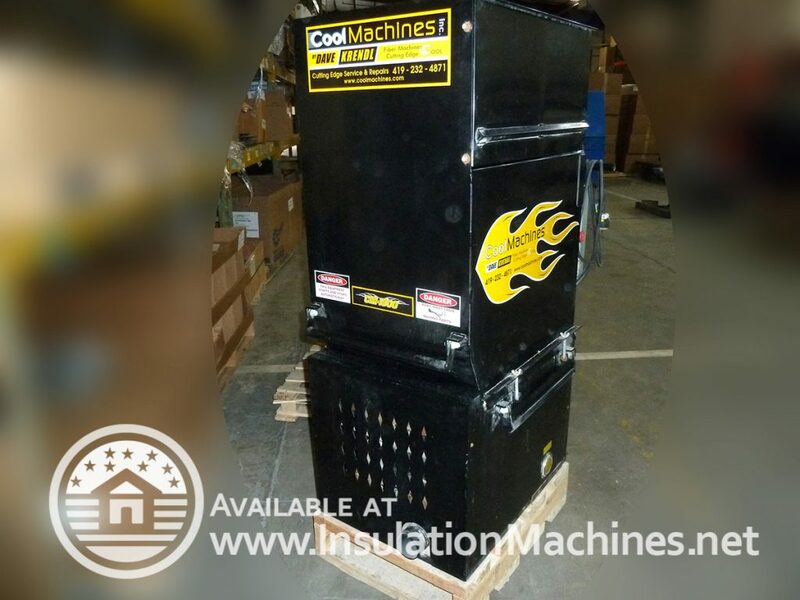 An already well-established spray foam insulation company purchased a CM1500 HP to add wall spray, attic and dense pack insulation to their services. 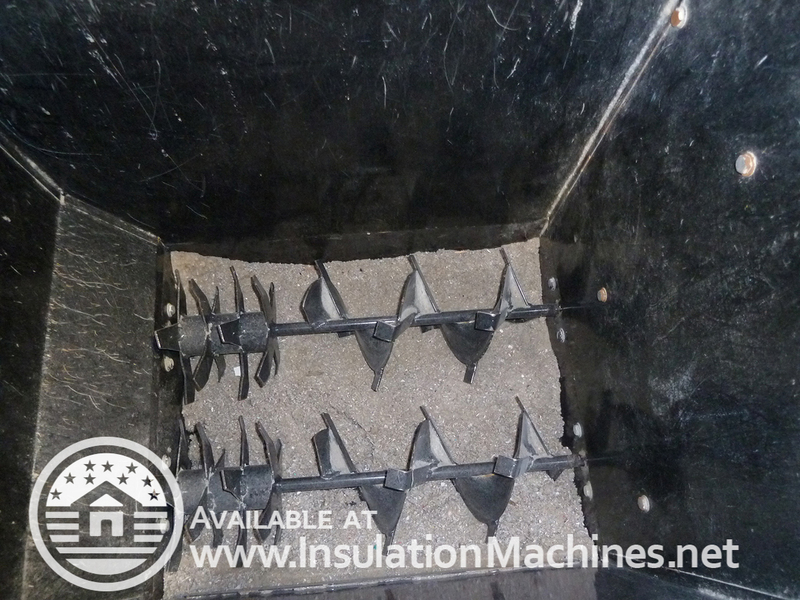 We insulated an attic with Owens Corning fiberglass. 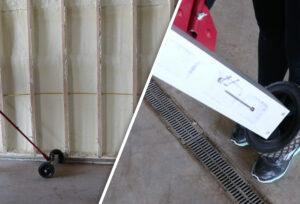 Then we erected a temporary wall and trained on cellulose wall spray. 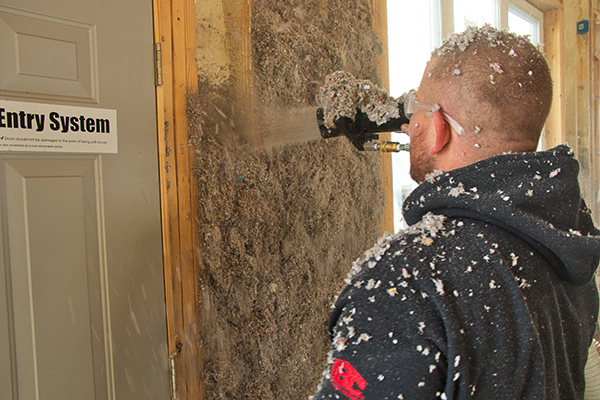 Using the “dry” method, we were able to spray cellulose into the wall with proper stabilization and far less water than most. We also created a promotional video for their facebook page. This company promotes their business through facebook. Within three days, the video had nearly 100 shares and well over 5,000 views. 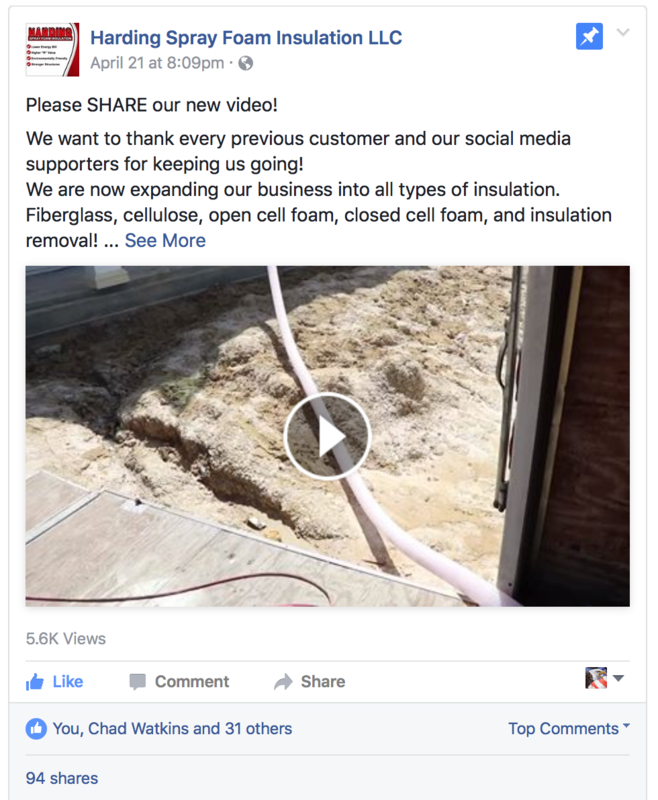 Pretty viral for an insulation company! We travelled to Aberdeen, South Carolina to meet with an approved Energy Doctor vendor: Custom Services. 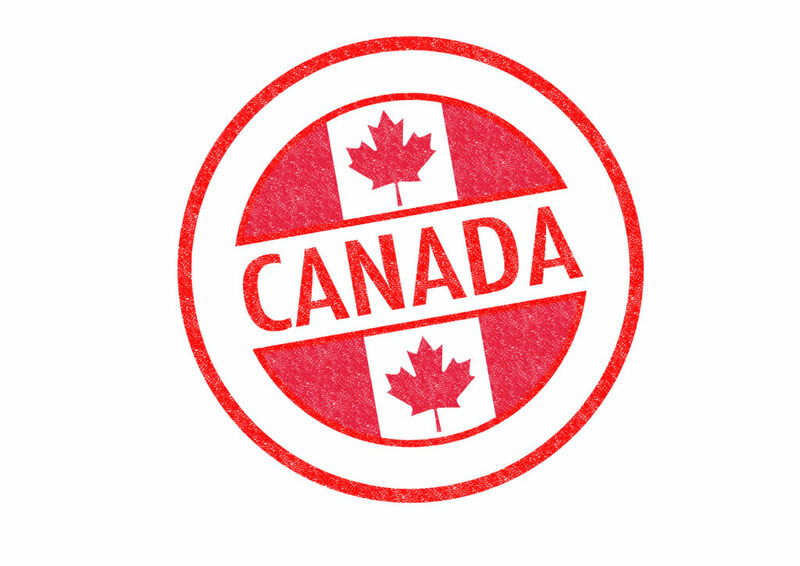 They purchased a CM700 two years ago and their business built up to the place where they needed more production. They purchased a CM2400 with an upgraded airlock for more production. With that, they added our internal wetting system and a generator with a slider. We created a promotional video for their company. This customer installed one of our generator sliders in their truck.